The Chenoweth subdivision, located in Brentwood, TN offers a sought after life style for those looking for Greater Nashville homes for sale on the southern side of the greater Nashville area. This community is comprised of about 300 homes whose prices vary from the high $400,000’s to the $700,000’s. It stretches between Concord Rd. and Edmondson Pike and features great community amenities. This makes Chenoweth an easy neighborhood to plug into. Chenoweth is zoned for Edmondson Elementary School, Brentwood Middle School, and Brentwood High School, some of the best schools in the area. You can check out the school test scores on the Williamson County Schools website and visit each of these schools websites by clicking on their names above. The community features tennis courts, community pool and playground area. 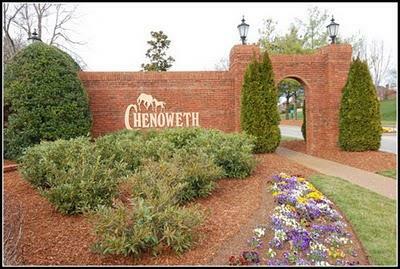 Beautiful gates and large well maintained flower beds mark the entrance to Chenoweth. Treed double boulevard entrance make this neighborhood stand out. They even support their own swim team much to the enjoyment and encouragement of the many children in this lovely community.